TAGBoston is supporting, and contributing to, the efforts of a group of active and retired Boston Public Schools (BPS) teachers who are concerned about the current attacks on our profession, from President Obama’s support of charter schools and merit pay to Wisconsin’s attempts to limit collective bargaining to the media-driven impression that “bad teachers” are to blame for the achievement gap. Public perception matters. In order to counteract the current “narrative” they believe, and we agree, that teachers must speak out about the complexity of our work, the commitment we bring to it, and the daily challenges we experience. 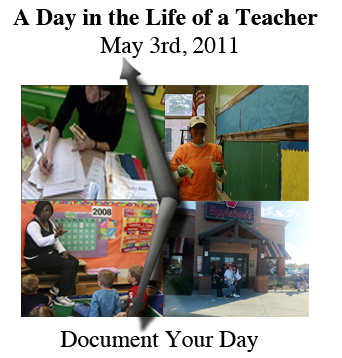 They propose to gather the stories of active teachers in public schools throughout the city, from many different levels and disciplines, during a single day: Tuesday, May 3, 2011. Please consider participating in this project! You will need to document your school-related activities for a full day in detail. * Do you wake up at 5:30 AM to correct papers or worrying about a student? * Do you arrive at school an hour early to prepare materials or tutor students? * Do you spend your lunch period calling families or sharing ideas with colleagues? * Do you monitor bathroom use or resolve student conflicts during your “free” time? * Do you conference with students during class time while monitoring independent work? * Do you stay after school for meetings or lead extracurricular activities? * Do you take a graduate class in the evening? * Do you stay up past midnight reading student essays or revising lesson plans? We know that these and many other activities fill our days and make it difficult to find time to write, but consider the possibilities for this ONE day. Use a camera, cell phone, or laptop computer if writing in a notebook is not your style. Write in list or narrative form; set a timer for every 15 minutes throughout the day and jot a note to yourself about what’s happening and what you’re doing at that moment. Record conversations with students, questions asked of yourself, decisions made, ideas shared, joys and frustrations experienced. Reflect, but avoid editorializing – leave that up to the reader. Names and schools will not be identified in any publication without your permission. If this appeals to you, please send us your contribution to the May 3rd “Writing Our Day” Project via e-mail to info@TAGBoston.org by May 10th. Include your name, school, grade, subject area, and contact information (email + phone). We will bring your writing to our next meeting (Wednesday, May 4th, 3:30PM at the Bowditch School in JP) and invite all participants to join us for a discussion of next steps! Those of us not currently in the classroom will take on the task of organizing materials, editing, and exploring options for publication.